Bradford (pop. 290,000, with suburbs 478,000) is the twin city of Leeds (their respective centres are only 15km away) and England's 4th most populous metropolitan area (which does not mean the 4th largest city, though). The name Bradford is a corruption of 'Broad Ford'. Founded in Norman times, Bradford developed its own wooling industry in the 13th century, but it was really with the industrialisation in the 19th century that Bradford's textiles acquired world fame. 19% of the city's population are are from ethnic minority groups, with a sizeable Pakistani community, which owned Bradford the nickname of "curry capital of Europe". Unfortunately, racial tensions have also made the headlines in Bradford, with some of the worst street riots seen in Britain in recent years taking place in the summer 2001. Bradford can be called a beautiful city. Its main attractions are comprised in a few museums, the Venetian-Gothic Wool Exchange and the district of Little Germany. On top of the list is the National Media Museum, which alone is worth the trip to Bradford. It welcomes 750,000 visitors annually, making it one of the most popular museums in the UK. Two museums unique to Bradford in the UK are the Colour Museum, dedicated to wool-dying and colouring, and the Peace Museum, which retraces the history of the peace movement . 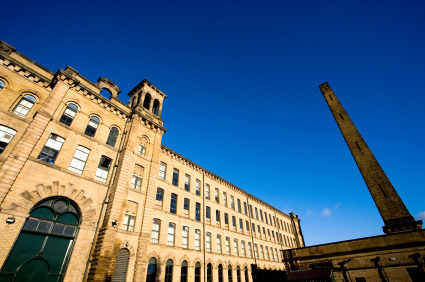 But let us not forget that Bradford was once the world capital of textiles, which will have no more secret for you after visiting the Bradford Industrial Museum (open 10am to 5pm; admission free), 5km outside of the centre. 5 km (3 mi.) north of Bradford is the UNESCO World Heritage Site of Saltaire, a village constructed on the River Aire in 1853 by philanthropist and textile magnate, Sir Titus Salt (1803-1876). Not only did Salt provide better houses (with running water) to his workers than most industrialists, he also believed that workers were more efficient if they were contended and educated. In a paternalistic impulse, he built a hospital and an Institute for recreation and education, with a library, a reading room, a concert hall, billiard room, science laboratory and gymnasium. When Salt's Mill opened in 1853, it was the biggest factory in the world, larger than St Peter's Cathedral in Rome, and has 1,200 looms. Saltaire has its own station and is 10min by train from Bradford station (£1.10). 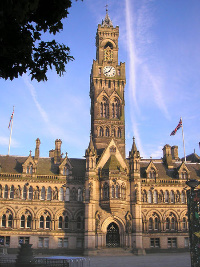 Bradford is located halfway between York and Manchester, immediately west of Leeds. The M62 motorway runs between Hull, Leeds/Bradford, Manchester and Liverpool, the A65 goes northwest to Skipton and Kendal, while the M1 runs southward to Sheffield, Leicester and London. There are no direct train to London. You'll have to change at Leeds, 20min away (£2.30). Other direct trains run to Manchester (1h10min, £10.50), York (1h, £10) and Skipton (35min, £4.70). National Express has direct buses between Bradford and London (5h20min, £18.50), Leeds (25 to 45min, £1.50), Manchester (1h, £6.50), Liverpool (2h to 2h30min, £9.50) Sheffield (1h30min to 2h, £4.50) and Newcastle (4h, £12.75), among others.